Joanne White posted Sunday June 10, 2018. Our 2017-2018 race season officially concluded last night with a huge presentation dinner held at the beautiful Hotel Grand Chancellor in Brisbane. Sprintcars Queensland drivers, crews, officials and sponsors dressed up for the elegant affair, in which we were treated to a night of relaxed fun, good food and plenty of entertainment as we celebrated the absolutely massive season that we have just had, the achievements of our drivers and teams, and thanked our invaluable volunteers, supporters and sponsors. John Kelly opened the event before introducing our MC for the night, a man who probably needs no introduction at all, master-entertainer Wade Aunger. A short season recap video played on the big screen, before dinner was served and presentations could get underway. We started with Appreciation Awards for a few truly unique people and companies who contribute so much to Sprintcars Queensland, and without whom we could not possibly have had the season we have had - our Series Sponsors. First up was East Coast Logistics and Queensland Speedway Spares, who, as two of our biggest sponsors, have made such significant contributions to our club this season. Wendy McNamara from KRE, Ken and Kaye Thorne from Myla Graphics and Clem Hoffmans from Spanloc Tools have all made substantial contributions as our Associate Sponsors and their invaluable support is endlessly appreciated by everyone in Sprintcars Queensland. Clem Hofffmans took the opportunity on stage to thank John and Kathy Kelly for everything that they do for Sprintcars Queensland and Sprintcar racing in Australia. This remarkable pair do far more for this club and this sport than many could possibly imagine, dedicating countless hours to all things that make Sprintcars Queensland run the way it does, giving us places to race, as well as their roles on the national level. Their passion for Speedway and Sprintcars has helped make this club what it is today. Our car counts are climbing, the quality of our fields are some of the best that has ever been seen locally and their tireless efforts behind the scenes running the show should not be underestimated. To say Thank You to John and Kathy (and family) for all that they do seems so inadequate, but the reality is that there are no combination of words that could ever come even close to be adequate. Because of them and all that they do, we can go racing. Whilst John and Kathy put in enormous effort to give us a place to race at, these race meetings we all love so much could not happen without the dedicated team of volunteers and officials that keep the show going on race nights. This team makes sure the drivers are ready for their races and know where they are starting, update our social media channels for those race fans who cannot be trackside, and are usually the first on scene checking on our drivers when things go wrong on the racetrack. Glenn Wilson, David Tracey, Chris Dvorak, Daniel Roberts, Aysha Tracey and Joanne White all received appreciation awards for their efforts this season. Moving on to the East Cost Logistics Series final positions and, we worked our way, backward, through the series contenders. Between prize money and Queensland Speedway Spares Vouchers a total of $34,933 was distributed to the East Coast Logistics Series contenders. John Weatherall, who heads the Motorguard Motorsport team, and his beautiful wife Vicki-Jane were thanked for their many years of support, and were congratulated on their 50th wedding anniversary, which they will soon celebrate. 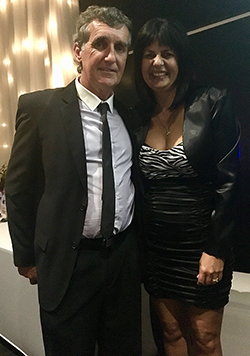 John and Vicki-Jane have a love and a bond that should be an inspiration to us all, and everyone at Sprintcars Queensland wish them both every possible happiness for many more years ahead. Rookie of Year this year went to Randy Morgan, and while Morgan started his season a little late, he did not fail to impress on track and is sure to be major player in the coming years. He is an immensely talented young man with huge potential and is definitely one to watch and a deserving winner of our 2017-2018 Rookie of the Year award. Cody Maroske took out our Most Improved Award for the season, and while, by his own admission, things did not always quite go as planned for parts of the season, a quick time in qualifying and some podium results are certainly significant achievements in such a tough field. Crew Chief of the Year went to Michael Gee who spins the spanner for his son Mitchell and, together with a dedicated team, was invaluable in helping the team secure some truly impressive results this season. Mitchell has came such a long way with his race craft in just a few short years, and that, at least in part, can be attributed to the skills, advice and support of his father and Crew Chief. Ausdeck Patios and Roofing took out the Best Presented Car award this year, the striking duo of Andrew Scheuerle and team owner Stewart Craig lifting the bar with their eye-catching blue-orange and blue-green combinations. The Best Presented Crew this year went to Luke Oldfield and his team, the many crew and their families always making an impression at each and every race meeting. Mitch Gowland and Kristy Bonsey both received Encouragement Awards for their efforts this season, while Kris (Cowboy) Jennings took out the Development Series. Mark Pholi won the wings award, Karl Hoffmans secured the B-Main Champion, while Luke Oldfield won the Heat Race Points battle. The Drivers Driver Award is voted on by the drivers present in the room on the night, and is considered a true honour to win. The winner is one who is highly respected by the drivers he or she races against each week, a driver whom has been deemed by his or her peers to be one of the best and fairest drivers in the field. This year Ben Hilder was voted the Drivers Driver, a popular vote and an award that no doubt means a lot to the often quietly spoken pilot of the #95 Motorguard Motorsport racer. Clem Hoffmans and Spanloc Tools donated a large toolbox again this year, to be awarded to a driver present in the room on the night by random draw. This year it was Brent Kratzmann who scored the toolbox, while Hoffmans and Spanloc Tools also put up $100 cash for a second random draw, this time going to White Family Racing. The presentations concluded with the presentation of our three biggest awards â€“ the Queensland Club Championship. Peter Lack secured third overall, with Andrew Scheuerle second and Luke Oldfield taking out Championship honours. Raffles were held throughout the night, with prizes kindly donated by Sprintcars Queensland, John Titman Racing, Spanloc, Ausdeck Patios and Roofing, John and Kathy Kelly, GW Racing, BHR Fabrications, the Ayers Family, KRE Race Engines and Queensland Speedway Spares. There were over twenty prized, values at over $3500. And now with the 2017-2018 race season officially complete, we can start counting down until the 2018-2019 season starts - just under 14 weeks until our first race of the new season. Massive thanks once again to John and Kathy Kelly for organising last night, and to all the drivers, teams, families and sponsors that made the 2017-2018 season, and last night, incredible. See you all next season, and don't forget to support the people and business who support Sprintcars.